To systematically review the literature to determine which interventions improve the screening, diagnosis or treatment of cervical cancer for racial and/or ethnic minorities. Medline on OVID, Cochrane Register of Controlled Trials, CINAHL, PsycINFO and Cochrane Systematic Reviews. We searched the above databases for original articles published in English with at least one intervention designed to improve cervical cancer prevention, screening, diagnosis or treatment that linked participants to the healthcare system; that focused on US racial and/or ethnic minority populations; and that measured health outcomes. Articles were reviewed to determine the population, intervention(s), and outcomes. Articles published through August 2010 were included. Thirty-one studies were included. The strength of evidence is moderate that telephone support with navigation increases the rate of screening for cervical cancer in Spanish- and English-speaking populations; low that education delivered by lay health educators with navigation increases the rate of screening for cervical cancer for Latinas, Chinese Americans and Vietnamese Americans; low that a single visit for screening for cervical cancer and follow up of an abnormal result improves the diagnosis and treatment of premalignant disease of the cervix for Latinas; and low that telephone counseling increases the diagnosis and treatment of premalignant lesions of the cervix for African Americans. Studies that did not focus on racial and/or ethnic minority populations may have been excluded. In addition, this review excluded interventions that did not link racial and ethnic minorities to the health care system. While inclusion of these studies may have altered our findings, they were outside the scope of our review. Patient navigation with telephone support or education may be effective at improving screening, diagnosis, and treatment among racial and ethnic minorities. Research is needed to determine the applicability of the findings beyond the populations studied. Unfortunately, the continued existence of cervical cancer and the disparities noted in its incidence and mortality suggest that these interventions have not been wholly successful. Among those newly diagnosed with cervical cancer, 30–60 % have never had a screening test.47,48 Up to 15 % have had inadequate follow up after an abnormal Pap smear.48 Sixty to eighty percent of women diagnosed with advanced cervical cancer have not had a screening test within the past 5 years.49,50 Interventions that maximize the prevention, screening, diagnosis or treatment of cervical cancer are critical to eradicate this disease. Currently, there exists no consolidated evaluation of the intervention research literature to determine which interventions improve cervical cancer prevention, screening, diagnosis or treatment for racial or ethnic minorities in the US. The purpose of this systematic review is to fill that gap. We conducted a systematic review of the English language literature to assess studies that described and evaluated interventions with the potential to improve cervical cancer prevention, screening, diagnosis or treatment for racial and/or ethnic minorities in the United States. We conducted an electronic search of the following five databases from their inception through August 2010: MEDLINE on OVID, The Cochrane Register of Controlled Trials, CINAHL, PsycINFO, and Cochrane Systematic Reviews. We used an identical search strategy for each database (see Text Box 1). In addition, we searched the reference sections of relevant review articles as well as all included studies for additional manuscripts. This review does not have a published protocol and therefore, was not registered. Titles and abstracts were reviewed by one author to determine eligibility for inclusion. Eligible studies had to meet all five inclusion criteria: 1) represent an original study; 2) include at least one intervention designed to improve cervical cancer prevention, screening, diagnosis or treatment that linked participants to the healthcare system; 3) present data for racial and/or ethnic minority populations in the US; 4) measure direct outcomes such as HPV vaccination (cervical cancer prevention), Pap tests (cervical cancer screening), follow up of abnormal Pap smears (cervical cancer diagnosis or treatment of premalignant disease of the cervix) or treatment of cervical cancer; and 5) report findings in English. We did not include conference abstracts or unpublished studies. Articles not meeting inclusion criteria were reviewed by a second author. When possible, disagreements were resolved by discussion; when this was not possible, a third author evaluated the title and abstract. Articles not recommended for exclusion were then reviewed in full. Following full text review, those articles that did not meet all five inclusion criteria were excluded from further review using the process described above for the title and abstract review. Figure 1 summarizes the literature search and data selection process. Summary of literature search and selection process. We reviewed the included articles to determine the population, intervention(s) outcomes, study design and sample size. We did not contact authors about the possibility of unpublished subgroup analyses. One author rated the methodological quality of each of the included articles using a modified scoring algorithm based on criteria developed by Downs and Black (DB).9 To describe the risk of methodological bias for each study, we added one item from the Cochrane Collaboration tool10 to the DB tool, resulting in a maximum modified DB score of 29. Articles with a DB score >20 have been found to be of very good quality, those with scores 15–19 are of good quality, 11–14 of fair quality and <10 of poor quality.43 A second author conducted a 23 % re-review of publications; the interrater Pearson’s correlation coefficient was .97. To determine the effect of each type of intervention, we classified studies by intervention type. Because most intervention strategies consisted of more than one intervention, we also grouped studies with similar intervention components together to determine the effect of the combination of interventions. We evaluated the strength of evidence for individual interventions and for groups of similar interventions using the criteria developed by the GRADE Working Group.45,46 This system utilizes four domains (bias, consistency, directness, and precision) to assess the strength of evidence as high, moderate, low, or insufficient. After removal of duplicates, the electronic search of the five databases yielded 2371 articles (Fig. 1). Following title and abstract review, we excluded 2192 articles for failure to meet one of the inclusion criteria, leaving 179 articles for full text review. Following full text review, 149 articles did not meet one or more of the inclusion criteria and were excluded; 21 of these studies were excluded due to lack of linkage to the health care setting. This left 30 intervention studies for detailed review. Review of the reference lists of relevant review articles and of all included studies identified one additional article for inclusion.31 Therefore, 31 studies were included in this systematic review. Twenty-four studies described interventions to increase cervical cancer screening and six studies described interventions to improve the diagnosis and treatment of premalignant lesions of the cervix. One study described interventions both to increase screening for cervical cancer and to improve the diagnosis and treatment of malignant or premalignant lesions of the cervix.42 No studies described interventions to improve HPV vaccination. Of the eight studies that included a single intervention, four evaluated the effect of educational materials alone to increase the rate of screening for cervical cancer in minority populations.12,32,33,40 For two of these studies, the educational materials consisted of letters32,40; for the other two studies, the intervention consisted of videos.12,33 Overall, Jibaja–Weiss found an increase in the rate of screening for cervical cancer for patients who received a form letter (43.9 % form letter vs. 39.9 % control), though not for patients who received a tailored letter (23.7 % tailored letter vs. 39.9 % control).40 However, this difference was not statistically significant. 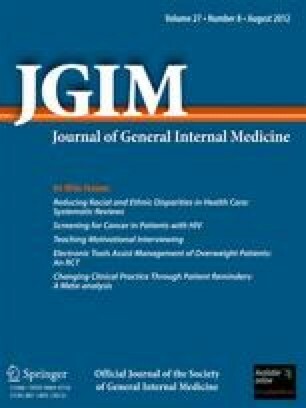 After examining the findings by patient race and ethnicity, Jibaja–Weiss found a statistically significant decrease in the rate of screening for cervical cancer for African American, Mexican American and white women who received a tailored letter.32 While white women who received a form letter experienced increased odds of screening (OR 2.13, 95 % CI 1.13–4.03); African American and Mexican American patients did not (for African Americans, OR 0.96, 95 % CI 0.63–1.46; for Mexican Americans, OR 1.17, 95 % CI 0.78–1.76). Rivers found that when the Pap smear was described as detection behavior, a group of African American, Latino and white women were twice as likely to obtain a Pap smear when the message was loss-framed than when it was gain-framed (95 % CI 0.91–4.39).33 When the Pap smear was described as prevention behavior, women were no more likely to obtain a Pap smear when the message was gain-framed than when it was loss-framed (OR 1.14, 95 % CI 0.55–2.36).33 Yancey showed educational videos to a sample of low income African American, Latina and white women in a clinic waiting room. She found the proportion of women seen in the clinic receiving screening was higher during intervention weeks than during control weeks (clinic 1: 26.9 % intervention vs. 19.4 % control, p = 0.01; clinic 2 14.6 % intervention vs.10.3 % control, p = 0.02).12 Because of the inconsistent effect of the interventions, the strength of evidence that educational materials improve screening for cervical cancer in minority populations is insufficient (Tables 1 and 2). Dietrich AJ, et al. Annals of Internal Medicine. 2006. Telephone support calls including navigation provided by a prevention care manager. Jibaja–Weiss, et al. Patient Education and Counseling. 2003. 23.7 % in the tailored letter group received screening vs. 43.9 % in the form letter group vs. 39.9 % control (not statistically significant). Fernandez, et al. American Journal of Public Health. 2009. Though a higher percentage of women in the intervention group completed screening compared to the control group (39.5 % vs. 23.6 %, p < 0.05), intention to treat analysis revealed no statistically significant difference in cervical cancer screening between the groups (24.2 % vs. 18.9 %, p > 0.05). Mock J, et al. American Journal of Public Health. 2007. Intervention: Education by lay health workers. Written educational materials. Navigation. Advertisements in print, television and radio. Rate of Pap smear in intervention group increased from 65.8 % to 81.8 % (p < 0.001); control group increased from 70.1 % to 75.5 % (p < 0.001). Increase in combined intervention group significantly greater than that in media only group (Z test p = 0.001). Control: Advertisements in print, television and radio. Written educational materials. Wang X, et al. Journal of Women’s Health. 2010. Intervention: Educational materials (written materials, videos). Education by lay health educators and by race and language concordant physician. Navigation. Screening rate 70 % intervention vs. 11.1 % control, p < 0.001. Control: General health education by lay health educators. Written educational materials including information about sites that provided free screening. Encouragement to visit providers for screening. Jibaja–Weiss ML, et al. Journal of Health Care for the Poor and Underserved. 2005. Jandorf L, et al. Progress in Community Health Partnerships: Research, Education, and Action. 2008. Education by staff and lay health workers. Navigation. At 2 month follow up, rate of Pap smear screening was 51 % intervention group vs. 30 % control (p 0.0801). In multivariate analysis of women nonadherent to screening guidelines at enrollment, the intervention was associated with increased odds of having a Pap smear (OR 3.9, 95 % CI 1.1–14.1 p = 0.0437). Margolis KL. Journal of General Internal Medicine. 1998. Lay health advisers offered women who were due for screening an appointment with a female nurse practitioner. At follow up, the screening rate increased in the intervention group compared to usual care (70.3 % vs. 62.9 %, p = 0.02). While the screening rate increased for African American women and for Native American women, this increase was not statistically significant. Rivers SE, et al. Journal of Health Psychology. 2005. Videos with loss- or gain-framed messages about cervical cancer prevention or detection. When the Pap was described as detection behavior, women were 2.00 times more likely to obtain a Pap when the message was loss-framed than when it was gain-framed (95 % CI 0.91–4.39). When the Pap was described as prevention behavior, women were 1.14 times more like to obtain a Pap when the message was gain-ramed than when it was loss-framed (95 % CI 0.55–2.36). Taylor VM. Journal of the National Cancer Institute. 2002. For participants at the US study site, the rate of Pap testing in the interval between randomization and follow up was 37 % for intervention 1 (p = 0.07 vs. control), 22 % for intervention 2 (p 0.98 vs control), and 22 % for the control. The rate of Pap testing in the prior 2 years was 69 % for intervention 1 (p < 0.001 vs. control, p = 0.01 vs. intervention 2), 48 % for intervention 2 (p = 0.34 vs. control), and 39 % for the control. Suarez L, et al. American Journal of Preventive Medicine. 1997. Education delivered by television, newspapers and radio, as well as by lay health workers. Written educational materials including information about clinics offering low-cost examinations. Creation of a cancer consortium. Post-intervention, the percent of women reporting a recent Pap smear increased by 5.9 % in the intervention group (45.5 % to 51.4 %) and by 6.6 % in the control group (50.1 % to 56.7 %). These differences were not statistically significant. Rimer BK. Patient Education and Counseling. 1999. Proportion of women who received cervical cancer screening was higher in the intervention 3 group: 64 % vs. 52 % intervention 2 vs. 56 % intervention 1, p = 0.05. Intervention 2: Tailored communications to patients (letter, newsletter). Intervention 3: Tailored communications to provider (newsletter) and patients (letter, telephone counseling. Paskett ED, et al. Cancer Epidemiology, Biomarkers and Prevention. 1999. Education by lay health educators. Educational information (written). Advertisements (busses, newspapers, radio). Education for health care providers. Visual prompts in examination rooms. Protocol and tracking system for women with abnormal test results. Personalized letters for women with abnormal test results. Women in the intervention city were more likely to have received cervical cancer screening in the past 3 years compared to the control city (adjusted OR 3.8, 95 % CI 1.6–9.2). Bastani R, et al. Med Care. 2002. Continuing medical education for health care providers (workshops, meetings). Referral forms, chart reminder stamps, newsletter, feedback on screening rates for providers. Educational materials for patients (written, videos). Clinic level changes (protocols for follow up of abnormal Pap smears and for routine screening, increased clinic hours, improved staffing, upgraded equipment). The rate of screening for cervical cancer increased for the intervention sites vs. control sites at both the hospital (adjusted OR 3.06, 95 % CI 2.07–4.54) and the community health center levels (adjusted OR 2.34, 95 % CI 1.05–5.23). No effect was seen in the public health centers (adjusted OR 1.00, 95 % CI 0.63–1.56). Ornstein SM. Journal of Family Practice. 1991. Written physician reminders, patient reminders or both. Education sessions for physicians, a health maintenance flowsheet, and chart audits in both intervention and control sites. All sites showed a decrease in percentage of patients compliant with screening for cervical cancer: physician reminders -2.1 %, p = 0.12; patient reminders -4.5 %, p = 0.001, both reminders -0.8 %, p = 0.60; control -0.9 %, p = 0.54). Six videos about cervical and breast cancer prevention were shown continuously in the waiting rooms of two clinics. N = 1,744 Predominantly low income women. The proportion of women seen in the clinic receiving screening was significantly higher during intervention weeks than during control weeks (clinic 1: 26.9 % intervention vs. 19.4 % control, p = 0.01; clinic 2 14.6 % intervention vs.10.3 % control, p = 0.02). Nguyen BH, et al. Journal of Cancer Education. 2000. Physician reminder system, health education materials for physicians to give patients (written, videos), continuing medical education for physicians including written materials with information about low-cost options for care, newsletters for physicians, and access to information about cancer treatment and research for physicians. Randomized controlled trial of physicians. In multivariable analysis, physicians in the intervention group had a higher performance rate of cervical cancer screening than controls (p = .004). Sox CH, et al. Journal of Community Health. 1999. Community health aides trained to perform cervical cancer screening. The proportion of women receiving a Pap test during the baseline and follow up periods increased in the intervention group (0.44 +/- 0.04 to 0.48 +/- 0.05), but not in the control group (0.42 +/- 0.04 to 0.39 +/-0.02). The change in proportion between intervention and control groups was not statistically significant (p = 0.37). Language-concordant telephone support for women not up-to-date on screening, including navigation. Written educational materials were mailed to patients. For all women, increased up-to-date status for cervical cancer screening in intervention group vs.control group (adjusted OR 1.73, 95 % CI 1.31–2.27). Greater benefit for Spanish-speaking women (adjusted OR 2.18, 95 % CI 1.52–3.13). Gotay CC, et al. Preventive Medicine. 2000. Education by lay health educators. Educational materials (written, audiovisual). Vouchers for free screening. Access to a women’s clinic with a lay health educator in attendance. The proportion of women compliant with screening increased significantly (59 % to 67 %, p < 0.05) in the intervention community but not in the control community (63 to 64 %, p > 0.05). Lantz PM, et al. Women’s Health Issues. 2009. Medicaid expansion to cover treatment for patients through the Breast and Cervical Cancer Prevention and Treatment Act of 2000. Quasi-experimental: fixed effects, retrospective longitudinal time series design. Proportion of people screened who had an abnormal Pap test decreased for black women from 1995–00 to 2001–05 (11.9 % to 10.6 %, p < 0.05; and increased for Hispanic women (22.4 % to 22.7 %, p < 0.05). Rate of screening increased in both the intervention clinic (17.8 % to 56.9 %, p < 0.01) and the control clinic (11.8 to 18.2, p > 0.05), though the increase in the control clinic was not statistically significant. Mandelblatt J. Journal of General Internal Med. 1993. Same-day cervical cancer screening by a nurse practitioner during routine primary care clinic visits. Thompson B, et al. Cancer Causes and Control. 2006. Community level interventions: health fairs, block parties, festivals, fun runs. Educational presentations. Educational materials distributed. Between the intervention and control groups, there was no significant difference in the percent of Hispanic women ever screened for cervical cancer (91 % vs. 89 %, p = 0.44) and the percent compliant with screening (94.2 % vs. 93.7 %, p = 0.83). The percent of non-Hispanic white women ever screened increased in the intervention group compared to the control group (99.6 % vs 96.3 %, p = 0.04) as did the percent of women complaint with screening (80.4 % vs 88.2 %, p = 0.02). Organizational level interventions: Staff and volunteers spread messages about cancer prevention. Free or reduced cost screening. Small group level: Educational presentations. Individual level: Education by lay health educators. Whitman S, et al. Family and Community Health. 1994. Education by nurses and outreach workers. Written educational materials. Invitation to receive free screening. The percent of patients screened for cervical cancer increased in the intervention group (12 % at baseline vs. 26 % post-intervention, p < 0.001), but decreased in the control group (39 % vs. 17 %, p < 0.001). Free cervical cancer screening. Advertisements and media coverage to promote screening. Standardized procedure for screening of outpatients. Community cancer education program. Dissemination of information about early detection. Compared to the pre-intervention period (1970–76), the ratio of in situ to invasive carcinomas increased for black women in all age groups except age 70–79 (insufficient sample size) and age 10–19 (p = 0.01). In addition, the rate of cervical cancer decreased for black women in all age groups (p > 0.05 age 10–19, p = 0.05 age 20–29, p = 0.01 for all other age groups). Of the remaining four studies that addressed a single intervention to improve screening for cervical cancer in racial or ethnic minority populations,17,34,38,42 each evaluated the impact of a unique intervention. Margolis evaluated the impact of using lay health advisers to offer women due for screening an appointment with a female nurse practitioner.34 Because of the moderate risk of bias given this single study that utilized a quasi-experimental design and the lack of a statistically significant impact for minority populations, the strength of evidence is insufficient that offering women an appointment with a female nurse practitioner increases screening for cervical cancer in minority populations (see Tables 1 and 2). The fair or poor quality of the three other studies that addressed a single intervention to improve screening for cervical cancer in minority populations confers a high risk of bias. Therefore, the strength of evidence for these interventions is also insufficient (see Tables 1 and 2). Of the studies that evaluated the impact of multiple interventions, five included education delivered by lay health workers plus navigation in combination with other interventions (educational materials and/or messages in the media), on the rate of screening for cervical cancer.15,22,23,35,36 Compared to control, all found an increase in the rate of screening for cervical cancer with the intervention. Wang found a 70 % rate of screening for cervical cancer with the intervention for Chinese American women compared to 11.1 % for the control condition (p < 0.001).23 Mock found increases in the rate of screening for cervical cancer for Vietnamese women in both intervention and control groups (intervention 65.8 % to 81.8 %, p < 0.001; control 70.1 % to 75.5 %, p < 0.001).22 The increase in the intervention group was significantly greater than that in the control (Z test p = 0.001).22 Fernandez found that 39.5 % of Latinas in the intervention group completed screening compared to 23.6 % in the control group (p < 0.05).36 However, intention to treat analysis showed no significant difference in the rate of screening.36 Taylor found an increase in Pap testing for Chinese women in the interval between randomization and the follow up survey (37 % vs. 22 %); however, this finding was not statistically significant.15 Jandorf also found an increase in the rate of Pap smear screening following the intervention for Latinas that was not statistically significant (51 % vs. 30 %, p = 0.0801).35 However, multivariate analysis revealed a statistically significant adjusted odds ratio of 3.9 for the effect of the intervention on adherence to screening (95 % CI 1.1–14.1).35 Because of the low risk of bias due to the presence of multiple good quality studies, the consistency of study findings, and the imprecise estimates of effect, the strength of evidence is low that education delivered by lay health educators together with navigation increases the rate of screening for cervical cancer for minority populations (Tables 1 and 2). Two of the studies that evaluated the impact of multiple interventions on screening for cervical cancer examined the effect of navigation and telephone support.13,14 One of these studies also included written educational materials13; the other did not. Following the intervention, Dietrich found a 7 % increase in the proportion of women up to date for cervical cancer screening (95 % CI 0.03–0.11).14 Similarly, Beach found an increase in the up-to-date status for cervical cancer screening in the intervention group compared to the control group (adjusted odds ratio 1.73, 95 % CI 1.31–2.27).13 The benefit was greater for Spanish-speaking women than for English-speaking women (adjusted OR for Spanish-speaking women 2.18, 95 % CI 1.52–3.13; adjusted OR for English-speaking women 1.25, 95 % CI 0.81–1.91).13 Because of the low risk of bias due to one randomized controlled trial of very good quality, the consistency of study findings, and the precise estimate of effect, the strength of evidence is moderate that telephone support together with navigation increases the rate of screening for cervical cancer for minority populations (Tables 1 and 2). The remaining studies that evaluated the impact of multiple interventions on screening for cervical cancer examined the effect of unique combinations of interventions.18, 19, 20, 21,25,26,39,41 Due to the high risk of bias conferred by a single quasi-experimental study of good quality39 or a single study of fair or poor quality,16,18, 19, 20, 21,25,26,37,41 the strength of evidence is insufficient that these combinations of interventions improve the rate of screening for cervical cancer in minority populations (Tables 1 and 2). Of the seven studies that evaluated the impact of interventions to improve the diagnosis or treatment of premalignant disease of the cervix, four evaluated the impact of a single intervention27, 28, 29,42 and three evaluated the impact of a combination of interventions.24,30,31 In a randomized controlled trial, Brewster evaluated a single visit for both screening for cervical cancer and follow up of an abnormal result (High-Grade Squamous Intraepithelial Lesion (HGSIL), Atypical Glandular Cells of Uncertain Significance (AGUS) or carcinoma).29 She found that for women whose Pap smear revealed HGSIL/AGUS, 88 % in the intervention group were treated within six months of diagnosis compared to 53 % in the usual care group (p = 0.04).29 Because of the low risk of bias given the study design and quality for this single study, the direct measurement of outcomes, and the precision of the estimate, the strength of evidence is low that a single visit for screening for cervical cancer and follow up of an abnormal result results in improvement in the diagnosis and treatment of premalignant disease of the cervix in minority populations (Tables 3 and 4). Brewster WR, et al. Journal of the American medical Association. 2005. Single visit for Pap smear and follow up of an abnormal result (HGSIL, AGUS or carcinoma). For women whose Pap smear revealed HGSIL/AGUS, 88 % in the single visit program vs. 53 % in the usual care group were treated within 6 months of diagnosis (p = 0.04); in addition, 63 % in the single visit program vs. 21 % in the usual care group returned one year later for recommended follow up Pap testing (p = 0.02). Lerman C, et al. Journal of Clinical Oncology. 1992. Telephone counseling to increase adherence to follow up and treatment among women noncompliant with their first colposcopy appointment. 67 % in the intervention group were adherent to colposcopy compared to 43 % in the control group (p < 0.05). The odds of adherence to colposcopy were 2.6 times higher for the intervention group than the control group (p < 0.003). Miller. Journal of the National Cancer Institute. 1997. Brief telephone counseling following an abnormal Pap smear with or without a booster call prior to colposcopy. Compared to telephone appointment confirmation, telephone counseling resulted in increased adherence to the initial colposcopy appointment (76 % vs. 68 %, OR 1.50, 95 % CI 1.04–2.17), and for attendance at the 6-month colposcopy appointment (61 % vs. 36 %, OR 2.70, 95 % CI 1.15–6.51). Compared to telephone appointment confirmation, standard care resulted in decreased adherence to the initial colposcopy appointment (50 % vs. 68 %, OR = 0.47, 95 % CI 0.32–0.73) and did not impact adherence to repeat (6 month) colposcopy. Marcus AC, et al. Medical Care. 1992. Personalized follow-up letter and pamphlet or an audiovisual program on pap smears or transportation incentives (bus passes/parking permits). For the transportation incentive intervention, the odds ratio of returning for follow up was 1.48 (95 % CI 1.06–2.06). For the combination personalized form letter and audiovisual intervention, the odds ratio of returning for follow up was 2.30 (95 % CI 1.21–4.34). 5 years prior to the intervention and 5 years after the intervention. The number of days to definitive diagnosis decreased by 12.8 % for white women. The average time between a diagnosis of cervical dysplasia or cancer and initiation of treatment increased significantly for Black and Hispanic women. The probability that Black women would initiate treatment within 60 days of a cervical cancer diagnosis decreased 9 % (-0.094, 95 % CI -0.178 to -0.01). Intensive follow up, vouchers or both. Compared to the control condition, the odds of returning for follow up were approximately 50 % higher in the intensive follow up (OR 1.56, 95 % CI 1.12–2.17, p < 0.01) and in the voucher conditions (OR 1.50, 95 % CI 1.09–2.05, p < .01). The combined intervention was not significantly related to follow up care after taking into account the main effects of both interventions. Michielutte R, et al. Health Education Research. 1994. Messages in the media. Educational materials (written). Education for patients and the community. Education for providers (presentations, written materials). Quasi-experimental: single group, modified trend analysis. The % of black women compliant with follow up and treatment of abnormal Pap tests increased from 64 % pre-intervention to 79 % post-intervention (p < 0.001). Two studies assessed the impact of telephone counseling on the diagnosis and treatment of premalignant disease of the cervix.27,28 Compared to the control group, Lerman found the odds of adherence to colposcopy were 2.6 times higher for the intervention group (p < 0.003).27 Miller found that compared to telephone appointment confirmation, telephone counseling resulted in increased adherence to the initial colposcopy appointment (76 % vs. 68 %, OR 1.50, 95 % CI 1.04–2.17), and for attendance at the six-month colposcopy appointment (61 % vs. 36 %, OR 2.70, 95 % CI 1.15–6.51).28 Given the moderate risk of bias due to one randomized controlled trial and one quasi-experimental study of good quality, the consistency of the findings, and the precision of the estimate, the strength of evidence is low that telephone counseling increases the diagnosis and treatment of premalignant lesions of the cervix for minority women (Tables 3 and 4). One study evaluated the impact of Medicaid expansion to cover treatment for patients diagnosed with malignant or premalignant disease of the cervix through the National Breast and Cervical Cancer Early Detection Program.42 Due to the high risk of bias conferred by a single quasi-experimental study of fair quality and the lack of precision around the estimates, the strength of evidence is insufficient that this intervention improves the diagnosis or treatment of premalignant disease of the cervix in minority populations (Tables 3 and 4). The three studies that evaluated the impact of multiple interventions on screening for cervical cancer examined the effect of unique combinations of interventions.24,30,31 Due to the high risk of bias conferred by a single quasi-experimental study of fair quality, the strength of evidence is insufficient that these combinations of interventions improve the diagnosis or treatment of premalignant disease of the cervix in minority populations. This systematic review found a moderate strength of evidence that telephone support with navigation increases the rate of screening for cervical cancer in minority populations. The strength of evidence is low that education delivered by lay health educators with navigation increases the rate of screening for cervical cancer in minority populations. For all of the other interventions and combinations of interventions studied, the strength of evidence is insufficient that these interventions improve the rate of screening for cervical cancer in minority populations. This systematic review also found a low strength of evidence that a single visit for screening for cervical cancer and follow up of an abnormal result improves the diagnosis and treatment of premalignant disease of the cervix in minority populations. In addition, the strength of evidence is low that telephone counseling increases the diagnosis and treatment of premalignant lesions of the cervix for minority women. For all of the other interventions and combinations of interventions studied, the strength of evidence is insufficient that these interventions improve the diagnosis and treatment of premalignant lesions of the cervix for minority women. A single visit for screening for cervical cancer and follow up of an abnormal result may improve the diagnosis and treatment of premalignant disease of the cervix for minority populations, as may telephone counseling. A single visit for screening and follow up was evaluated in a population that was predominantly Latina; therefore, its findings are most applicable to this group. Telephone counseling was evaluated in a population that was predominantly African American; therefore, its conclusions are directly applicable to this group. Our search strategy may have overlooked studies that reported data on racial and ethnic minorities, but did not focus on these population groups. However, we feel this is unlikely because our search identified studies that focused on populations other than racial or ethnic minorities, such as women attending a community health clinic or low-income women. Though the original DB score has been validated and the use of DB to categorize studies qualitatively has been described,43 the use of this strategy to classify studies as very good, good, fair or poor has not yet been validated. Therefore, it is possible that we have misclassified some studies, especially those near the cut point for a qualitative score. However, because we were conservative in our estimate of risk of bias when determining the strength of evidence, if misclassification were to have affected our results, it would have biased our findings toward the null. We neither searched for unpublished studies nor contacted authors about potential unpublished subgroup analyses. Thus, the results of our review may be influenced by publication bias and might bias our findings away from the null. While navigation seems a core element of the interventions that improve screening for cervical cancer in minority populations, there is insufficient evidence to determine whether navigation alone improves this outcome. Because a single intervention may be more easily implemented and less costly than one that includes multiple elements, it is important to determine whether navigation alone improves screening for cervical cancer, as well as the added costs and benefits of adding lay health education or telephone support. In addition, because the combination of navigation and education programs conducted by lay health educators have been inadequately studied in African Americans or Native Americans, future research should fill this gap. As navigation in conjunction with telephone support has been inadequately studied in populations that speak languages other than English or Spanish, further studies should confirm that this combination of interventions is effective in these populations. Interventions with the potential to improve the diagnosis and treatment of premalignant lesions of the cervix are understudied. Future research should seek to extend the findings of the Brewster study29 to additional populations, especially African Americans, Asian Americans and Native Americans. In addition, future research should confirm the effect of telephone counseling in additional populations, notably Latinas, Asian Americans and Native Americans. Support was provided by a grant from the Robert Wood Johnson Foundation’s Finding Answers: Disparities Research for Change Program. The content is solely the responsibility of the authors and does not necessarily represent the official views of the Robert Wood Johnson Foundation or of Finding Answers: Disparities Research for Change Program. Surveillance Epidemiology and End Results. SEER Stat Fact Sheet: Cervix Uteri. Available at: http://seer.cancer.gov/statfacts/html/cervix.html. Accessed March 8, 2012. Higgins JPT, Green S (editors). Cochrane Handbook for Systematic Reviews of Interventions Version 5.0.2 [updated September 2009]. The Cochrane Collaboration, 2009. Available at: www.cochrane-handbook.org. Accessed March 8, 2012.